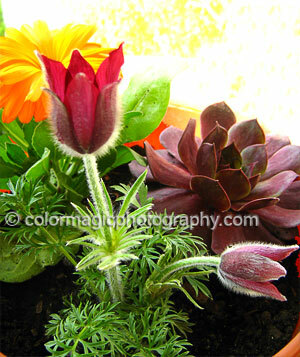 Pulsatilla vulgaris Rubra is a red variety of the Pasque Flower. This gorgeous wildflower blooms in early spring, usually around Easter, which leads to the common name Easter flower or Pasque flower. Pulsatilla vulgaris flower buds, as well as the flower stem and leaves are completely covered with silky hairs but when the flower opens, it reveals its gorgeous, velvety petals and a striking, contrasting yellow center. 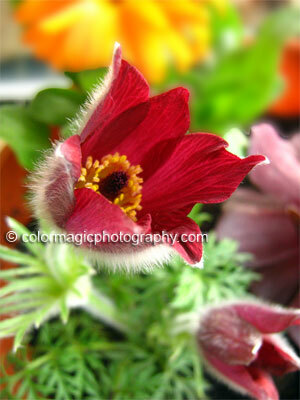 Red pulsatilla has deep maroon-red bell-shaped, upright flowers. All Pulsatilla varieties are clump-forming, herbaceous perennials with finely serrated, light green foliage with a silvery appearance because of the wooly hair that cover the leaves. The flowers are followed by silky, strange but ornamental seed heads. Meadow anemone, on its other name, grows well in full sun or part shade but being an alpine plant, it doesn't tolerate heat. This plant require good drainage and infertile soil, that make it a good candidate for rock gardens. Many hybrids and cultivars exist these days, in a variety of flower colors and names like Pulsatilla vulgaris 'Red Cloak' or "Red bells", including various shades of red, white, lavender and even pink. Que lindas fotos!!! Estava com saudades de visitar seu blog!omo você está? Boa semana!! !